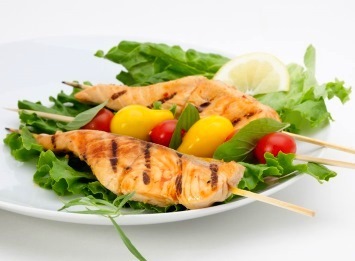 I love these grilled salmon kabobs. They are so easy to make and really delicious. Salmon is so healthy for us (wild if you can get it). The mixture of rice vinegar, ginger, a bit of garlic and some honey makes a lovely marinade. I think you will love this recipe. You can easily multiply it to serve as many people as you would like. In a bowl, whisk together soy sauce, honey, vinegar, ginger, garlic and pepper. Remove skin from salmon, then slice it lengthwise into long strips. Thread each strip onto short wooden skewer. Place skewers into a shallow dish. Pour soy sauce mixture over skewers, turning to coat well. Let stand at room temperature for 30 minutes. Thread 1 lemon wedge (if using) onto end of each skewer. Grill on greased grill over medium-high heat, brushing often with marinade, for 4 minutes on 1 side, then turn and grill for 3 to 4 minutes or until fish flakes easily. Makes 12 skewers. Serve 3 to 4 skewers per person. To remove the skin from the fish, gently slip a sharp knife under the skin at one corner of fillet. Using your free hand, peel off the skin while pressing against the fish with the flat edge of a knife. Of course you don’t have to cooked this grilled salmon recipe as kabobs or skewers. You can leave the salmon whole and just cook it for a minute or two more to cook through. If you really need this to be a completely gluten free recipe, make sure you buy gluten free soy sauce. Not all are completely gluten free. This is a great diabetic recipe. Healthy fats from the salmon are mixed with the health benefits of ginger and garlic. Most diabetics can easily handle the little bit of honey in this recipe, but if you are really sensitive to carbs just leave it out. It will still be delicious. If you want that touch of sweet, you can add stevia to the marinade recipe. Grilled salmon is just one of many ways to prepare this delicious fish. Look for more ideas here.